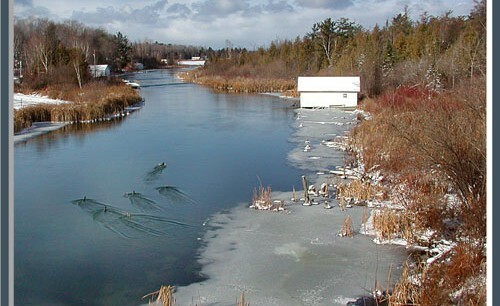 March 2011–Lovers of the Lake Leelanau Narrows will be happy to know that the Leelanau Conservancy has officially taken ownership of an embattled 2.25 acres and 430 feet along the eastern shoreline. Once the center of controversy, this land is now protected and will continue to preserve the water quality and scenic value of Lake Leelanau. For the past five years, the Lake Leelanau Lake Association had sought to prevent docks from being built along this fragile shoreline. A DEQ approved plan would have allowed a 250-foot broadside dock with 22 boat slips protruding into the narrow channel. Plans for development were dashed in part by the souring real estate market. Also, the property changed hands in 2009 and new owners, Egan McGlynn and Tim Cypher, wished to see the land remain natural. After months of negotiations and fundraising by the Lake Leelanau Lake Association and the Leelanau Conservancy, McGlynn and Cypher sold the land to the Conservancy. The Lake Association took on the role as partial funder and holder of a conservation easement. It took until early December to close on the project. The land, which has been the subject of paintings and countless photographs taken from the M-204 bridge in Lake Leelanau, is adjacent to already protected land known as the Conservancy’s Leugers Preserve at the Narrows. It is the third key parcel along the shore to be protected in a 10-year period. A total of 68 acres along the Narrows and 2,875 feet or about a half-mile of frontage now make up this beautiful Natural Area. This latest expanse of scenic shoreline is treasured by thousands of boaters who annually traverse the Narrows. Wetlands here also provide fish nesting habitat and a home to a great diversity of wildlife. With the help of generous members, the Conservancy successfully raised $150,000 toward the $250,000 purchase price. The Lake Association pledged to raise the balance of $100,000. John Fitzpatrick, past president of the Lake Association and Campaign Chairman for fundraising, says that $65,000 in cash and pledges has been raised to-date, with another $35,000 needed to achieve their goal. He expects more donations in response to a recent mailing to association members and property owners along the lake.